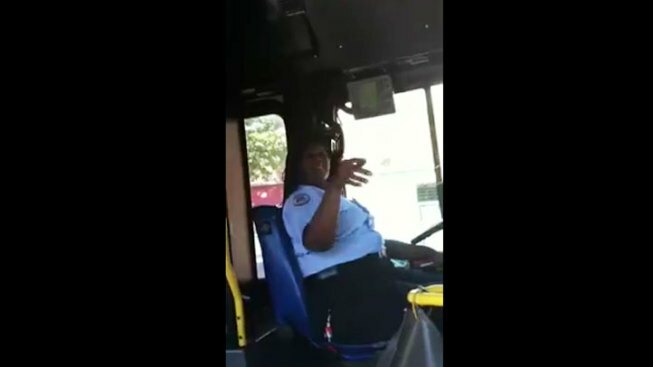 A Metro bus driver is off the job after a confrontation with a reporter was caught on camera. WTOP’s Mark Segraves says he was trying to parallel park on Idaho Avenue Wednesday when a Metro bus driver pulled up behind him, honking and making lewd gestures. He said she then ran through a stop sign. Segraves went to the next bus stop and confronted the driver about her actions, and recorded it all on his iPhone. You can hear Segraves ask why the driver hid her name tag and if he could get off the bus after the driver closed the doors behind him. "Can I get off your bus?" Segraves asked. The driver responded that he could call her “Miss Metro” and that he could get off at the next stop. She removed her nametag during the discussion. Metro spokesman Dan Stessel said there is no excuse for the driver’s behavior and that she has been placed on administrative leave while they conduct an investigation.